While we've been anxious to get Ghost Rider out of her slip for a sea trial, Rick wanted to wait until the diver could get back to the boat and not only clean the bottom, but take photos of the zinc anode positions on both prop shafts. That finally occurred on 06-Feb and everything below the waterline looked good. We got a good tide later that afternoon, so we sortied out into the river and headed downstream on a lovely winter day in southwest Florida – sunny skies, moderate southeasterly breeze, with air temps in the low 80’s. 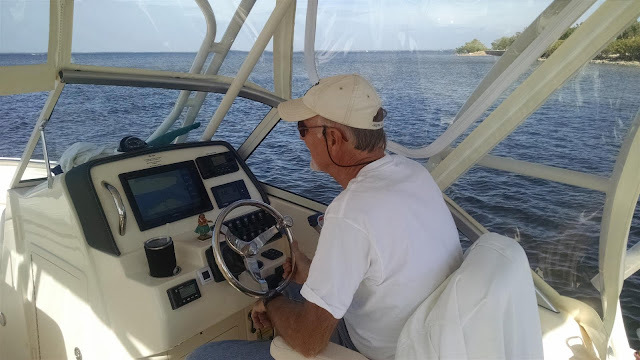 We had a bit of a struggle backing out of our tight corner slip this time….it took Rick a few minutes to figure out the right combo of thrusting to port with a back-and-forth throttle in the breeze that was pinning us to the dock. But we finally got out of there without kissing the dock or dinging the two boats beside and behind us. Pusher / Follower Collar....With Inadequate Water Flow. Back & Forth, Then Reset to Its Original Position. 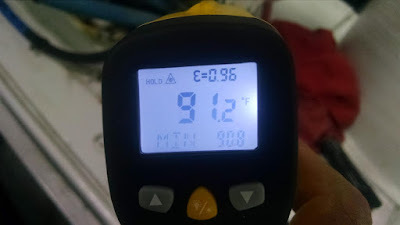 But within the first 30 minutes of the sortie the main shaft’s stuffing box was already above 100F in water temperatures that hovered around 72F….even at a low 1200 RPM. Not catastrophic by any stretch, but the drip rate was insufficient and that mark was certainly above Rick’s preferred target of ambient plus 20-25 degrees. So once again Chelle manned the helm and Rick went to work in the engine room making a series of stuffing box adjustments. It took another 30 minutes before he got it figured out, but eventually we got to the point where the main stuffing box was holding steady at just under 92F – even at wide open throttle. We (finally!) were able to declare victory on that item. 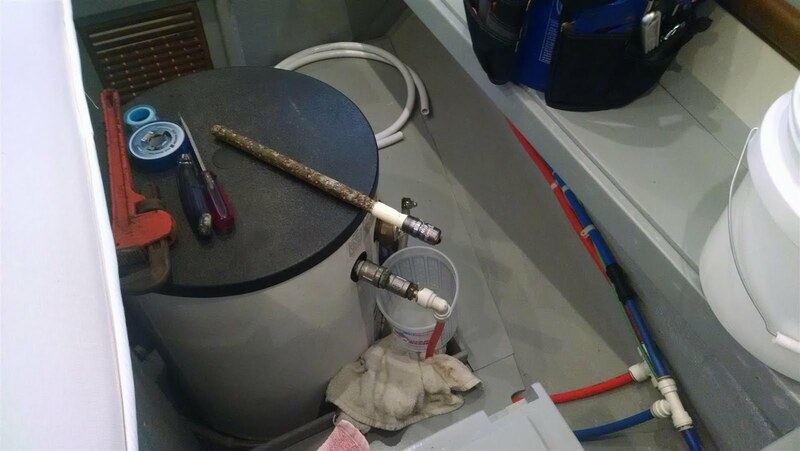 We did not have a lot of time to play with the wing engine’s shaft, but a short run revealed too-warm temps and insufficient water flow….we’ll schedule another sea trial where Rick can focus on and play with that one, but after some more dockside adjustments. Wing engine stuffing boxes tend to be temperamental, even without alignment issues, so that one is not a big surprise. a Very Good Temp Reading Even at WOT. All other systems were tactical on this sea trial sortie…basically it was a good day. 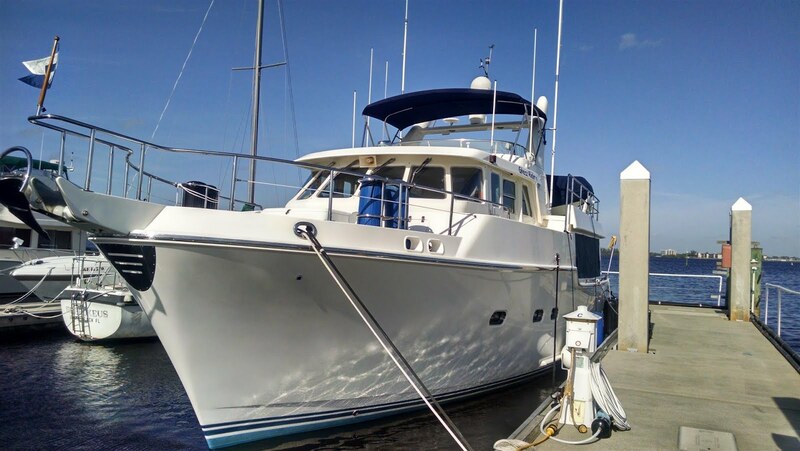 Upon return to Legacy Harbour Marina we decided to dock up stern-in to our corner slip vs. bow-in. 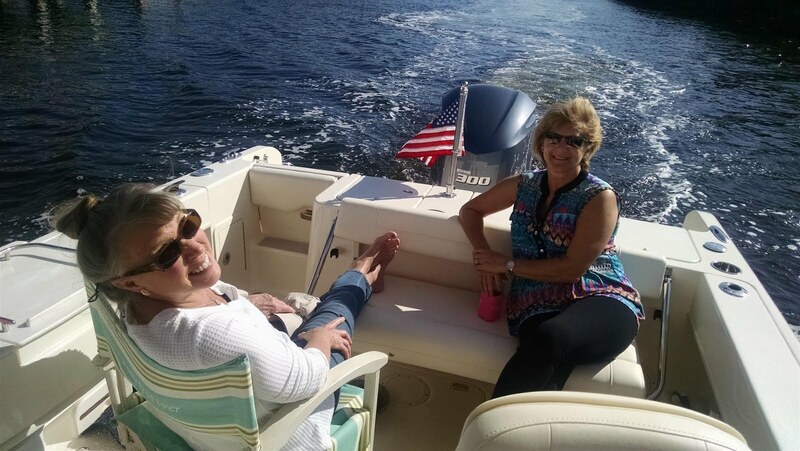 This was mainly to position Ghost Rider so we could launch the dinghy into water vs. onto the concrete dock, as we wanted to be in position to perform some sea trials on the tender’s outboard engine -- we have not run it since we left Palm Beach in late October. Rather surprisingly the docking went quite smoothly, with zero drama. That made it a very good day. After we got Ghost Rider tucked in, plugged in and cleaned up, Rick pinged James over at Yacht Tech via SMS to let him know the results; typical of James he immediately called back to Q&A about the details of the anode inspection and sea trial results, and make some recommendations for the wing engine. Classy guy. The next day we turned our attention back to the water heater. Craig from VIP Marine came to the boat in the early afternoon as previously scheduled. We managed to extract the big anode pipe from its near-permanent thread sealant, and replaced it with the new magnesium anode. 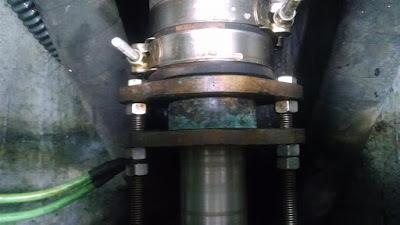 Rick also asked Craig to test the unit’s pressure relief valve while he was there as we had concerns with its discharge valve – it did not drain very well, nor did it appear to be fully closing once the lever was released. Turns out it was pretty much shot. A faulty pressure relief valve on a water heater can be dangerous – water heaters actually make pretty good bombs when that valve fails to meter temperature and relieve pressure. (When your bunk is located right on top of the thing it makes you ponder such matters.) We found a replacement valve at a nearby hardware store and swapped it out. 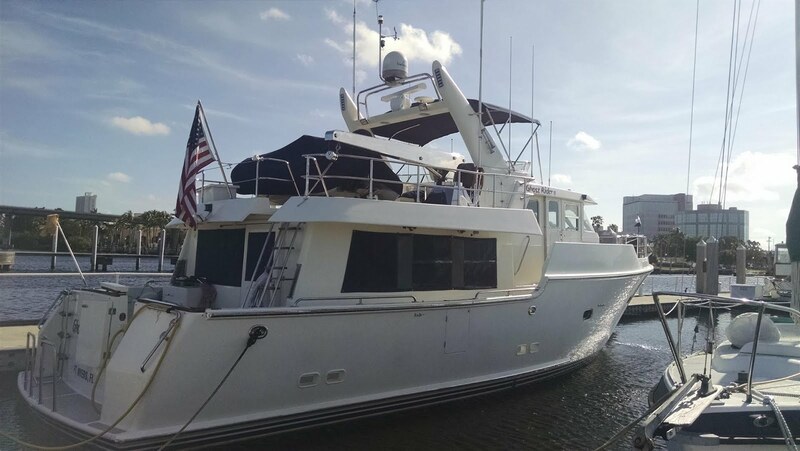 Next up: we've still got a few weeks to tend to some home-based administrative and social obligations while we also work through the remaining minor and preventative maintenance items for the boat, and continue to provision for the upcoming journey. Target dates sound too much like a "plan" but wishing you success with it. Let's get together before you (or we) depart. Congratulations Capt's Rick and Michelle. Glad things are working. 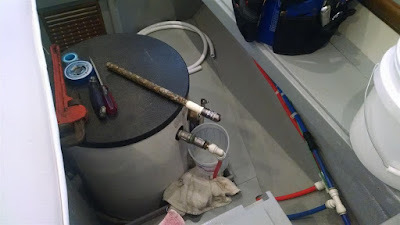 That's an interesting pic of the anode rod. When I change mine (in the house) after 3 yrs. it's a bit more than just a core wire. Almost all of the Mg is gone. Thanks again for the (go-fast!) boat ride. 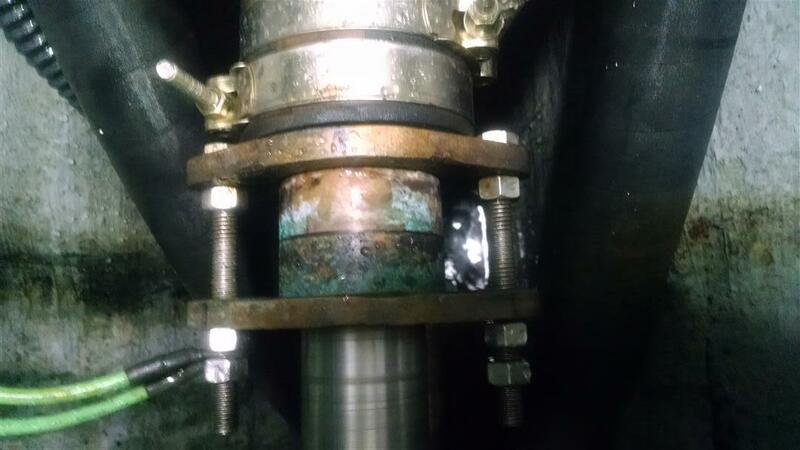 The anode was gnarly looking 'tho probably had some life left in it. Still feels better to have a new one along with the relief valve.